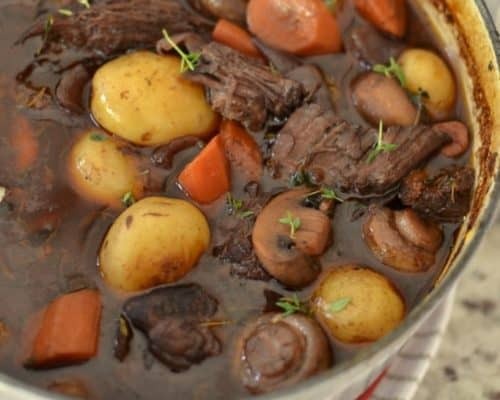 Beef Bourguignon Recipe also known as beef burgundy is beef braised in red wine with garlic, onions, carrots, potatoes, and bacon. This version is scrumptious yet easy enough for even the novice chef. Life is too short to reserve fabulous dishes for holidays and company. Beef Bourguignon Is absolutely one of my favorite dishes. It is absolutely perfect for this time of the year and you don’t have to an artist in the kitchen to make this. My recipe does not have quite as many steps as Julia Childs but I think it tastes just as good if not better. 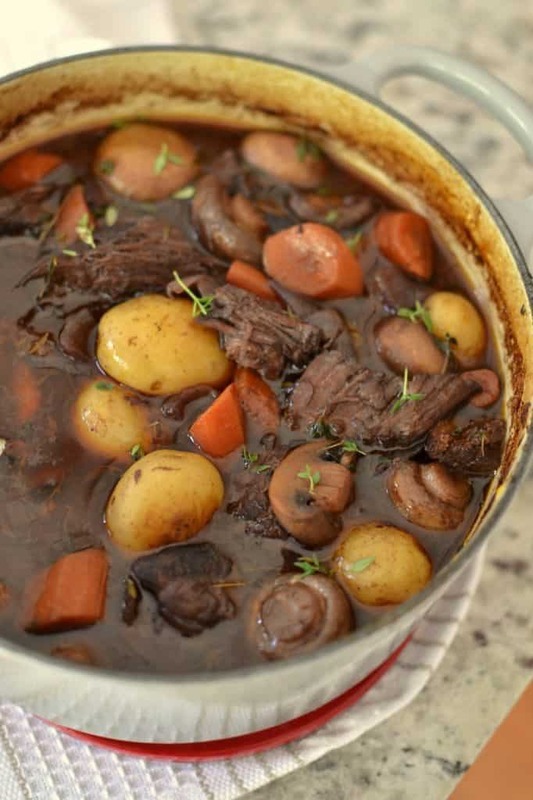 What cuts of beef do you use for Beef Bourguignon Recipe? I really like using chuck steak. It is one of the more economical cuts of beef. It slow cooks real well and has some fat so that the meat does not dry out which can happen if the meat is too lean. However you will need to pull the roast from pan after cooking and trim it before returning it to the stew. Other cuts of beef include bone in short ribs and fatty brisket. Do not purchase beef stew meat for this recipe. It is too lean and does not have enough fat and collagen. It will end up dry and tough. Trimming the fat and gristle from the beef is worth all the time and effort ten fold! 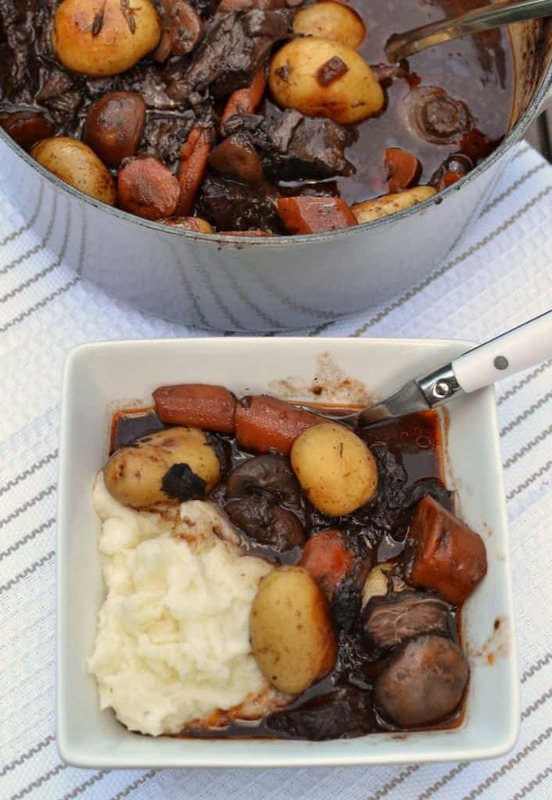 What do you serve with Beef Bourguignon? Just as any other stew is almost a complete meal in itself so is this one. You can serve over rice, mashed potatoes, or wide egg noodles. A nice crusty baguette with cold butter and a glass of Pinot Noir would put the icing on the cake. Other great wines to serve with this would be a Merlot or Cabernet Sauvignon. 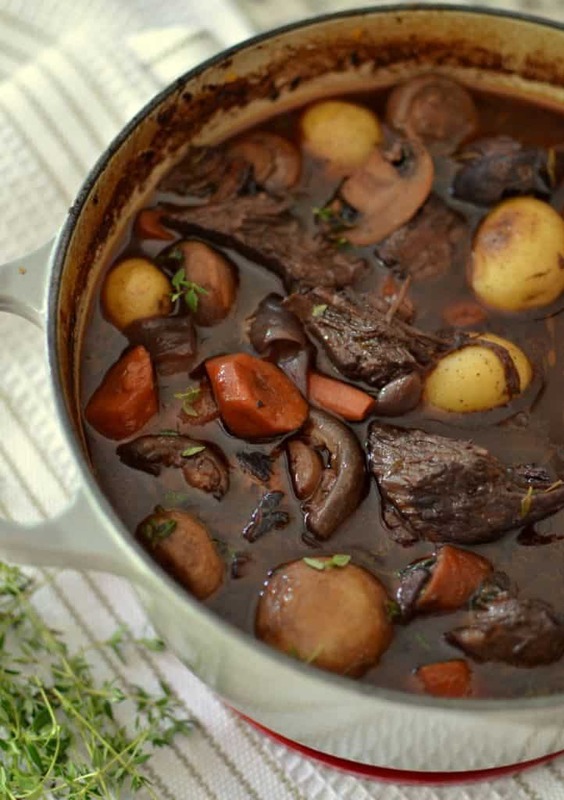 How do you make Beef Bourguignon Recipe? In large dutch oven or deep ovenproof skillet over medium heat brown the bacon until good and crispy. Remove to plate covered with paper towel using slotted spoon. Dredge chuck roast (aka chuck steak) in flour, salt and pepper both sides. Brown both sides in the bacon grease. Remove to plate. Add onions and carrots to the remaining bacon grease and cook until the onions are lightly softened. Reduce heat to medium low and add garlic and flour. Cook for a couple of minutes. Stir in wine loosening the brown bits from the bottom of the pan. Stir in beef broth, tomato paste, bay leaves, and thyme. Return chuck roast and bacon to pan, cover and place in center of oven. Cook for 3 – 3 1/2 hours or until chuck roast is very tender. Melt butter in separate skillet over medium high heat. Add mushrooms and cook until golden brown. Remove to plate. If necessary add more butter. Add baby potatoes and cook until light browned and slightly crispy. Add mushrooms and potatoes to dutch oven with stew. Continue cooking for about fifteen minutes or until baby potatoes are tender. 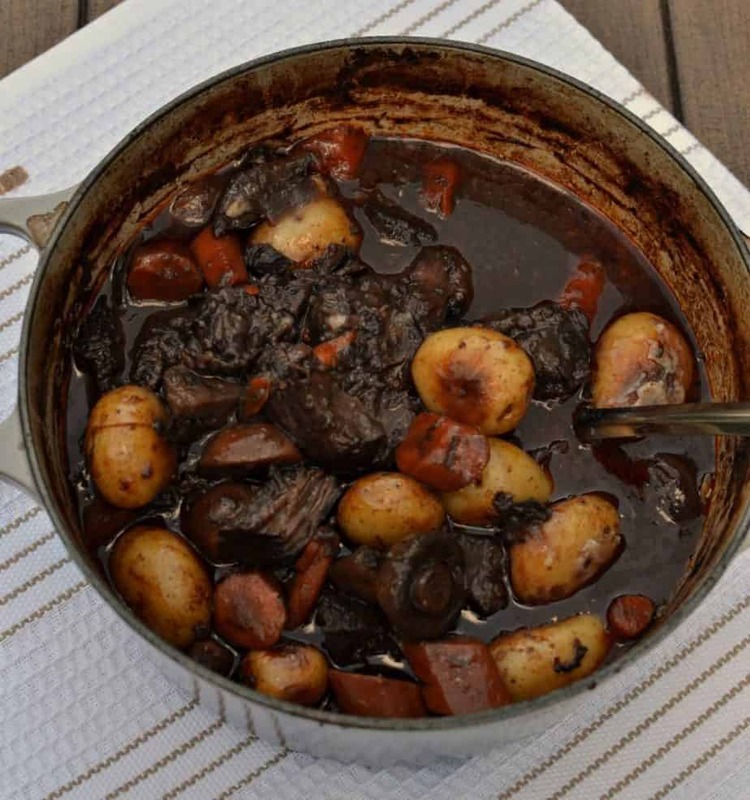 Which wine is best to use in Beef Bourguignon Recipe? I personally like to use a Pinot Noir. However this particular batch was made with a Cabernet Sauvignon. This one was particularly dark in color, rich and not overly tannic making it a perfect choice. However I had tried this Cabernet before so I knew it would be great in this. You could also use a Merlot or Cote du Rhone. Beef Bourguignon Recipe is beef braised in red wine with garlic, onions, carrots, potatoes and bacon. Scrumptious yet easy enough for even the novice chef. In dutch oven or deep oven proof skillet cook bacon until crispy. Remove to plate covered with paper towel using slotted spoon. Dredge chuck roast in one tablespoon flour, generously salt and pepper both sides. Brown both sides of the roast in the bacon grease. Remove to plate. Add onions and carrots to the remaining bacon grease and cook until the onions are lightly softened. Reduce heat to medium low and add garlic and 1 tablespoon flour. Cook for 2 minutes; stirring constantly. Stir in wine loosening the brown bits from the bottom of the pan. Stir in beef broth, tomato paste, bay leaves, and thyme. Return chuck roast and bacon to pan, cover and place in center of oven. Cook at 350 degrees for 3 – 3 1/2 hours or until chuck roast is very tender. In large skillet melt butter over medium high heat. Add mushrooms and cook until golden brown; turning a couple of times. Remove to plate. If necessary add 1 tablespoon of butter. Add baby potatoes and cook until golden brown; turning a couple of times. Add mushrooms and potatoes to dutch oven cover and cook for additional 15 minutes or until potatoes are tender. Take pot out of oven and remove lid. Allow to cool for 10 minutes and carefully remove the chuck roast. Trim any excess fat and or cartilage from the roast. Put the meat back into the pot and stir to warm. Garnish with fresh thyme. If desired serve over mashed potatoes, rice or egg noodles. If you don’t have a dutch oven you can use a deep oven skillet and cover with aluminum foil. This recipe looks amazing! I’m wondering if I could use beef or chicken broth in place of the wine? Or, is there another option? Red wine really is the foundation for Beef Bourguignon so if you were to fix it without it really would be more of a beef stew. Delicious as well but not as rich in color and flavor. All that being said you certainly could do that and make a great stew. I have Port wine on hand.. would that be ok? Yes it would. Sorry about the delay. I was out at the movies and dinner. I made this recipe and it was amazing. I use a bottle of Cabernet Savounion. I also added very small golden potatoes to the pot and served it with rice. My family enjoyed the rich flavor and like having crunchy sourdough bread to soak up the gravy. The time required to cook this dish is well work it. So glad that you liked it. Sounds like an amazing meal. I also love crunchy sourdough. Sounds like the meal was perfect. Yes I think that you could although you would need to do most of the process in a skillet. Like cook the bacon, brown the chuck roast, cook the carrots and onions and most of step 3, and brown the mushrooms in a skillet. But the actual cooking time can be done in a crock pot on low for about 8 hours or so. I would also add the baby potatoes halfway through the cooking process and the mushrooms in the last hour of cooking. Let me know if you have any more questions and I will try to help.